When it comes to the go-to options for a sunshine break in the Middle East, flashy Dubaidominates. But now, nearby Bahrain – an archipelago of 33 islands in the Arabian Gulf – is vying for the title of the hottest spot to holiday in the Middle East. Why? Well, with bucketloads of charm, 5000 years of history, beaches, luxury resorts and a hot, desert climate, there’s plenty to entice visitors looking for a desert destination offering something a little bit different. Geri Halliwell, Lewis Hamilton and Shakira are fans, while the late King of Pop Michael Jackson lived in Bahrain from 2005 to 2006. Intrigued, HELLO! 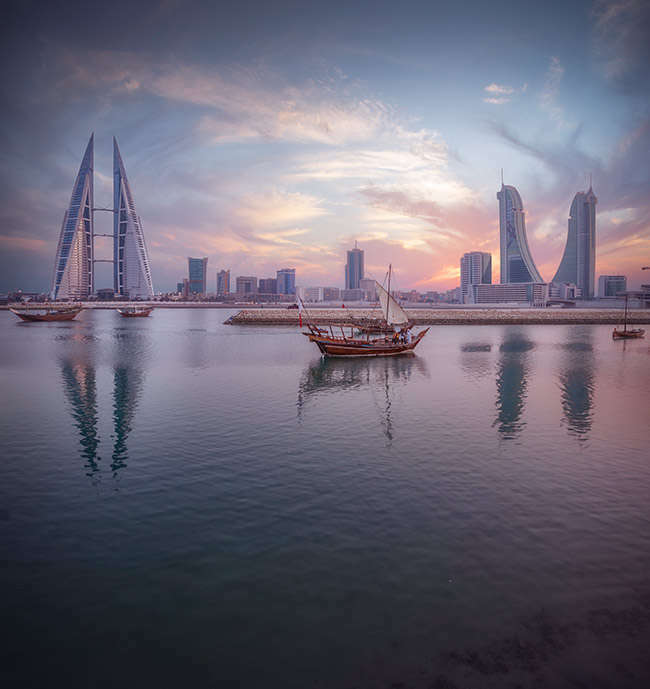 hopped on a flight out to the capital, Manama, to discover the best of Bahrain, and see exactly why this intriguing island nation is making a name for itself on the tourist trail. You don’t get much in the way of history in Dubai – but you get it by the bucketload in Bahrain, where Muhurraq Island has been crowned Islamic Cultural Capital 2018. Muhurraq – the second largest city in the country – was once the centre of the world’s pearl trade. Pearls are a huge part of Bahrain’s history and what made the nation wealthy, long before oil was discovered. Here, they’ve been diving for more than 2000 years – and you can have a go too! It’s not like in the old days when pearl divers spent months away from home at sea, lowered into the water on weighted ropes and forced to remain underwater for over a minute with nothing but a nose peg to control their breathing. (Thankfully!) No diving experience is necessary – all you need is a snorkel and a bit of determination. You’ll be given a net to collect oysters from the sea bed (don’t worry, it’s quite shallow), and once you’ve brought your haul back onto the boat, your guide will show you how to open the oysters and carefully check for pearls. It’s a real thrill when you find one – and they’re yours to keep if you do. 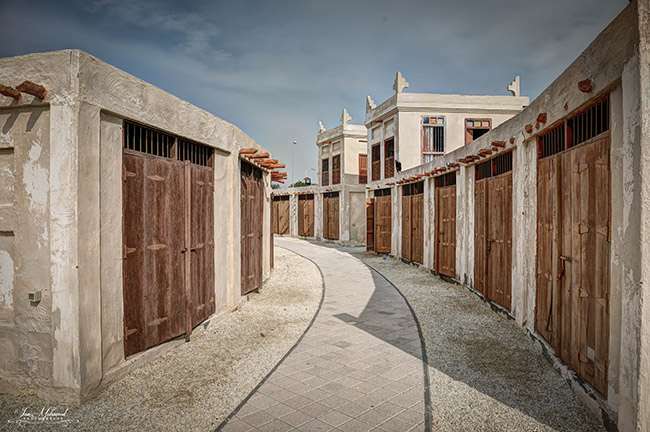 The ancient Dilmun civilisation was present in Bahrain 5000 years ago – and archeological excavations of this fort, now a UNESCO World Heritage Site, shows that it was their capital city. Since then it’s been rebuilt again and again, and is now a masterpiece of 16th century Portuguese construction. You get a different view of Bahrain from here, too, with the lush palm groves of the upmarket Budaiya district – popular with ex pats - visible behind the fort. Visit at sunset, or just after, when the site is floodlit, or take a horse-back tour of the surrounding area. If it’s sun, sand and sumptuous accommodation you’re after, then look no further than one of Bahrain’s 5* hotels. For a few days of topping up your tan in a luxury setting, Bahrain – located between the Qatar peninsula and the north eastern coast of Saudi Arabia - won’t be beaten. While in town we tried out the The Ritz Carlton on the north coast, home to a flock of flamingos, a private stretch of white sandy beach (the best on the island), and a wonderful Mexican restaurant Cantina Kahlo (the churros are to die for!). Prices start from £320 per night. Over at the Four Seasons in Manama, a soaring skyscraper hotel on its own island (with a new beach currently under construction), stylish dining is the order of the day, with celebrity chef Wolfgang Puck (best known for catering the Academy Awards) owning three of the seven restaurants on site. 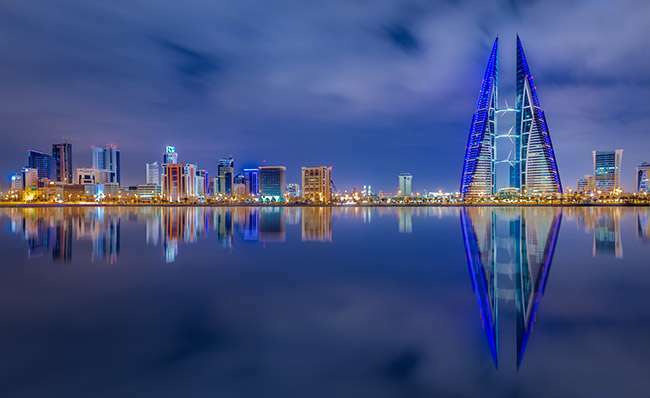 Once the sun sets the nighttime views of the imposing capital – especially the impressive twin towers of the Bahrain World Trade Centre - are incredible. Prices start from £325 per night. The Jumeirah Royal Saray is only just open for business and its decadent marble and gold-leaf interiors give it a palatial feel. We took over a luxury poolside cabana, with sweeping views over the Arabian Gulf and the private beach, and whiled away an afternoon of impeccable service, delicious food, and authentic Colombian coffee served by the hotel’s resident Colombian baristas. Introductory opening prices from £244 per night. Formula 1 weekend is the jewel in the crown of a jam-packed calendar of events in Bahrain, and the country really comes alive with the excitement of the Grand Prix. 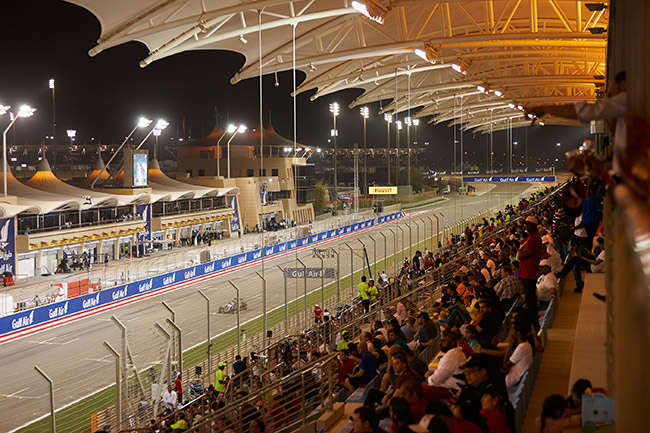 The track (Bahrain International Circuit) is located out in the Bahrain desert, and for three days it becomes a focal point for locals; even those without a ticket take their families along to soak up the atmosphere. Since 2013 the Grand Prix in Bahrain has been a night race, and it’s nothing short of thrilling. Just hearing the so-loud-it-hurts roar of the cars is enough to give you goosebumps. Spot celebrities, enjoy performances by international artists (we partied the night away to Santana), and, of course, watch the floodlit race. And if you’re an adrenaline junkie and want in on the action yourself then you can whizz round a giant circuit in your own car at the world-class go-karting BIKC track, adjacent to the Formula 1. You’ll feel like Lewis Hamilton! If you visit one place for breakfast in Bahrain, make it Haji’s Café. There’s no menu at this traditional Arabic eaterie, situated in an alleyway in the Manama Souq – you get what you’re given. And it’s all amazing, particularly washed down with mint tea. Poke your head into the kitchen and watch them make khubz (round leavened flatbread) in the furnace, and try to get a table outside to revel in the early-morning atmosphere of the Souq. If it’s dinner and drinks you’re after, check out Block 338. In the heart of the cosmopolitan Adliya district, this pedestrianised quarter is jam-packed with restaurants, art galleries and small boutiques. For cocktails and international tapas we loved Hazel Rooftop Lounge. When we were there there was a live saxophone player and a magician doing the rounds to entertain diners, and the tempura in particular was melt-in-your-mouth delicious. Halwa (Bahraini sweets) is a local delicacy you must sample while in Bahrain – preferably in Hussain Moh’d Showaiter Sweets, the most famous in the country, with two branches, both in Muhurraq. You’ll be given spoons to sample the sticky, syrupy liquid sweets on offer, and a sip of tea to wash them down. Our favourite was the figs halwa. Delicious. Also worth a visit for the out-of-this-world dessert platter alone (creme brûlée, ice cream, dragon fruit and more all served on a giant, spinning display plate) is the Downtown Rotana, where an open kitchen and different cuisine counters offer a fusion menu. After dinner head up to the Alto Lounge on the 25th floor for a cocktail and sweeping views of the dramatic skyline. For more information on the Kingdom of Bahrain, events and attractions please visit: btea.bh. Book a five nights stay at the Ramada City Centre, Manama with direct flights with Gulf Air and 3-day Grand Prix Grandstand tickets for £1,299 per person. To book visit motorsportstravel.co.uk/formula-1/bahrain-grand-prix/ or call 0207 183 2022. Gulf Air fly twice a day direct to Bahrain International Airport from Heathrow. Stay at the Swiss-belhotel, just a 20 minute drive from the airport and well located for all the local attractions, with rooms from £75 per night.